Despite voicing its support for the settlement of the Ukrainian crisis, the US is actually working to undermine the Minsk peace deal, Russia’s Foreign Ministry said, commenting on the deployment of American military instructors to Ukraine. The Russian Foreign Ministry is “gravely concerned” by the fact that military instructors from the US, UK and Canada will be training the troops from Ukraine’s National Guard, stressed the ministry’s spokesman, Aleksandr Lukashevich. “This begs the question: Do they – in Washington, London and Ottawa – understand whom are we talking about? As they are the same Ukrainian ultra-nationalists from volunteer battalions, who wore Nazi emblems and blurred themselves with the blood of women, children and the elderly during reprisal raids in Donbass [south-eastern Ukraine],” he said. “What will these foreign military experts teach them – how to continue killing those, who speak Russian?”the spokesman wondered. Moscow views the information that the National Guard training program will include exercises with Western-style weaponry and hardware as a possible “first step towards the supply of modern US arms to Ukraine, which the ‘party of war’ in Kiev is so eager to get its hands on,” he said. Supporting any revanchist ambitions of warmongers in the Ukrainian government “may lead to the resumption of bloodshed” in the south-east of the country, Lukashevich warned. The ministry believes that the US actions are in violation of the peace deal, which was signed by Kiev and the representatives of Donetsk and Lugansk during talks in Minsk on February 12, he said. “The Obama administration, which verbally advocates the settlement of the Ukrainian crisis, is, in fact, contributing to the disruption of the Minsk agreements,” he stressed. According to Moscow, Washington is trying to divert the international community’s attention from its military deployment in the Ukraine “by a ‘smokescreen’ of claims of an alleged presence of Russian troops in Donbass,” which hasn’t been backed by any proof. READ MORE: US ‘crossed all imaginable lines’ forcing Ukraine to do its bidding – Russian Def. Min. 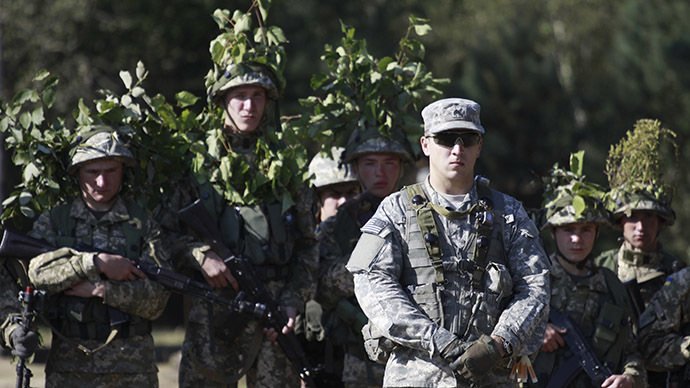 “It’s obvious, that the US troops on Ukrainian soil won’t bring it peace,” Lukashevich concluded. On Friday, paratroopers of the US 173rd Airborne Brigade, based in Vincenza, Italy, have arrived in western Ukraine to provide training for Ukrainian troops. 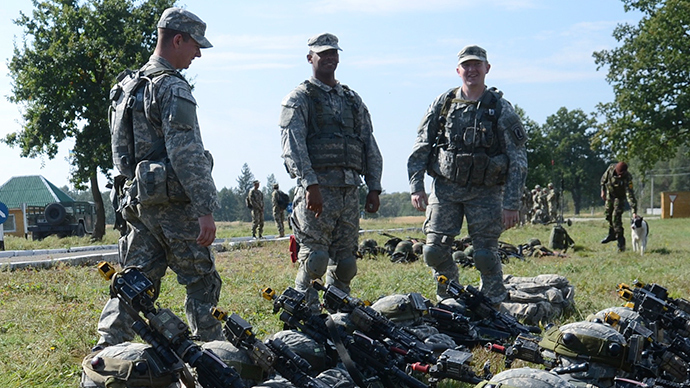 Some 290 US troops are to take part in long-term joint drills with combat units of the National Guard, Arsen Avakov, Ukrainian Interior Minister, wrote on Facebook. The US paratroopers’ training mission will last for 24 weeks and involve some 900 Ukrainian servicemen, Ukraine's President, Petro Poroshenko, and US Vice-President, Joe Biden, agreed earlier in spring. Kiev and rebels signed a ceasefire deal in February, which involved the pullout of heavy weapons and a profound political dialogue and constitutional reform, which would address the grievances of the dissenting regions and reintegrate them into Ukraine. The deal has more or less held so far, with the level of violence in eastern Ukraine dropping significantly, OSCE monitors on the ground have been reporting. The Ukrainian conflict began in April 2014 after Kiev sent troops to Donetsk and Lugansk Region as people there refused to recognize the new coup-imposed authorities in the capital. A year of fighting in south-eastern Ukraine has resulted in over 6,000 deaths, including score of civilians, according to conservative UN estimates.